Just a quick thank you to all at Polydome for the quick efficient service, especially Zara for all the advice which made things easy. I would like to say a big thank you to Zara and the two boys who came to fit my growhouse last Friday. Zara was a great help and great at the advice as were not 100% sure what we were looking for at the time of ordering. Also the two boys last Friday who came to fit the Growhouse were two gentlemen, pleasant and excellent at their jobs, I would appreciate if you could pass on my gratitude to them both. We are delighted with the work and will be recommending ye to both family and friends who are enquiring from us already! Thank you sincerely for a very professional service. We are enjoying the benefits of the polytunnel as the weather has gone cold and this is extending our season for Horticulture. Thank you for listening to our requests and needs and for meeting them in an informed, practical and professional manner. Being situated way down in the south west, we are blessed with a good amount of sun and warmish temperatures, however there is a down side. We are hit by strong, salt laden winds regularly during the year. This makes the planting of cuttings and raising of young, tender sown or bought plants difficult, especially on a larger scale. The salt scorches everything but the toughest waxy leaved plants and has over the years destroyed many plants and ruined a lot of hard work. The solution was simple, though it took a while to see it; a polytunnel. The best of all worlds, the sun, the temperature and most importantly no scorching or salt laden wind. I started asking around among friends for suppliers and got many different names of people and companies, some of whom had unfortunately gone bust in the downturn, others had simply given up due to lack of sales, others again whose polytunnels were obviously just not strong enough. All this meant I needed a company with a good track record, still in business who built polytunnels strong enough to withstand the gales that regularly sweep through the southwest coast. 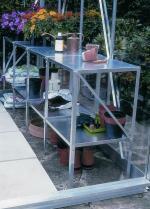 I searched the internet, garden forums, reviews and suppliers sites provided a huge amount of information. One thing I noticed was that a good few makers and suppliers of polytunnels stated that they used Polydome products. If the other producers thought Polydome products were the best to use, then it stood to reason that they must be good. This lead me to look up the Polydome website. Very quickly all the other saved searches were deleted, I had found what I was looking for. After working out how big I wanted the tunnel and then adding a bit, I called Polydome and reached Zara. Helpful, knowledgeable and lovely to talk to, she made discussing all my options simple and straight forward. She recommended certain features to help strengthen the tunnel against the wind, which I happily took (and bought accordingly). I was very aware that I would not have thought of these improvements myself. It was delivered a week and a half later without a hitch and the driver went through every part with me as we unloaded. I decided to put it together myself and put the money I saved into buying a slightly larger tunnel. I'm fairly handy at building, following instructions and have a good set of tools so it was no problem, I had the help of my brother-in-law and I must admit that my wife helped and explained one bit I couldn't get my head around. The instructions were great and I made sure I read them a few times before starting, as recommended. Unless you're quite good at building and DIY I think I'd recommend that you paid a little more and got Polydome to put it up for you. It was good to know too that advice and help was at the end of the phone if needed. So far it has shrugged off a couple gale force 9's one of which was gusting to force 10. A big thank you Zara. The polytunnel is 6m x 14m so not small, however it is filling up fast and I'm already watching things grow, its now November and I'm really looking forward to next year. 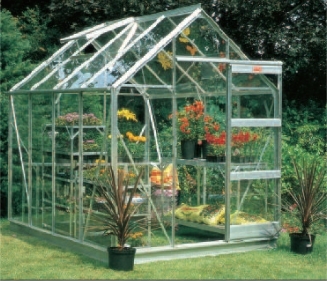 I can't recommend this polytunnel enough, especially to anyone in coastal, exposed or windy areas. In an age when many people only contact manufacturers in order to complain when something goes wrong, we thought you might like to know how well our hobby tunnel, erected in 2006, withstood the storms of last winter. On February 12th, the ferocity of the wind on our exposed site near Arklow demolished all our fencing panels, ripped the asphalt covering from the garden shed and smashed several panes of greenhouse glass. Our Polydome tunnel alone defied the elements, emerging at the end of it all as solidly anchored as ever, with all its polythene cover intact, proof if we ever needed it of its superior construction and the excellence of the materials you use. Congratulations - and heartfelt thanks! Patricia and Roger, Co. Wicklow. Padraig O Briain, Horticulture Tutor. Just a quick email to let you know that we are very pleased with our new tunnel. The plastic went on very well - Mindy was a pleasure to work with, very professional. Yourself and Val have also been fantastic throughout the whole process. The customer service we have had from Polydome has been outstanding. It makes such a difference when you are dealing with professionals. We shopped around for our tunnel and although Polydome was more expensive than other companies we are very happy with our choice. The tunnel looks good and sturdy and should see us through the first few years of our new business venture. The only slightly negative feedback would be that the instructions were difficult to follow, we had four different manuals for the various bits and it got confusing. Thankfully Mindy helped us out with the doors ! Thanks again for all your help. Having long dreamed about a polytunnel we took the plunge earlier this autumn. We chose Polydome after asking around and checking out websites and visited the Polydome HQ in Birr one Saturday, where Zara, full of enthusiasm and useful advice, showed us over tunnels of different sizes and shapes. Although as novices we found the instructions a little mystefying, Pauric was very helpful and reassuring on the phone. On the day chosen the two-man team arrived early and spent most of the day erecting our lovely polytunnel, taking the rather sloping site in their stride. We're absolutely delighted with it and looking forward to next season's growing.